Farming looking to change our views through farming responsibly. Does healingpixie belong in this group? 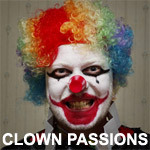 I'm 19 years old, I have a big love of clowns and dress up as one but I'm not a professional clown. I also do art, I'm a vegan and would love to meet some vegan clowns but I'm aware of how unlikely that is haha. I love animals, I have a cat and a bunny, I like fashion, and as a disclaimer I am dealing with serious mental health issues. Does anxioustofu belong in this group? Does lovedoctor052 belong in this group? Does cimmaronrose belong in this group?